The product is fed using a variable speed roll feeder controlling the flow to the intake aspirator. The roll feeder enables the operator to easily and accurately adjust the flow to fit each individual situation. Screen blockage is prevented by using 2″ rubber balls. Over 40 years ago, LMC tried the woven type ball racks like those used by others. LMC found the relatively flat surface of woven ball racks did not give the proper aggressive, random action to the cleaning balls, so LMC developed a special system using round rods to impart the required action to the cleaning balls. 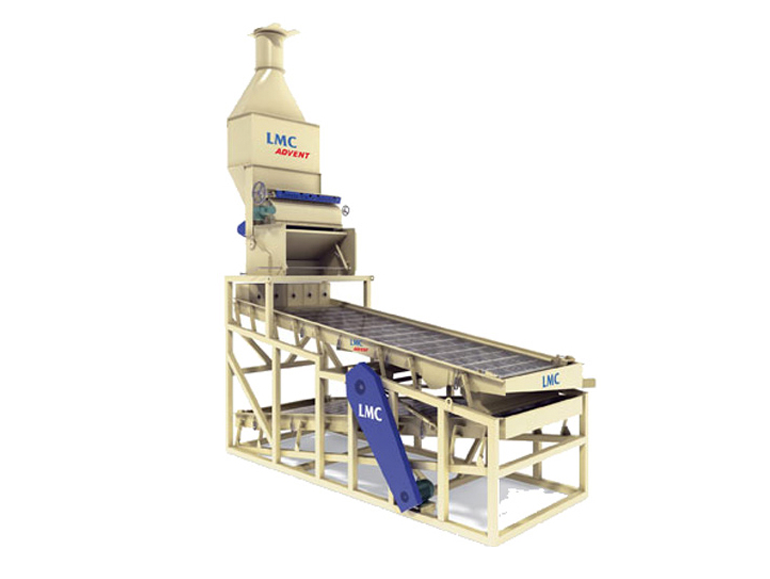 While the screen configuration can be designed to any particular need, the first screening is normally a sifting process to remove the smallest reject particles. After the initial sifting the product rides to the scalping area of the top deck. A draper curtain is used over the scalping screens to prevent the sticks, pods, or any oversized particles from standing on end and passing through with the good product. After leaving the scalping screens, the product is gently discharged to the lower deck. This deck will precisely grade the product to any particular count and can be equipped with multiple discharges to satisfy production specifications. All screens are mounted on tubular steel frames 24″ wide and are easily handled. To keep the screening section from becoming an expensive conveyor, the product must be properly distributed to the screens. If the product depth is deep, the product cannot find the screen to separate. In most cases, the siftings are generally lighter than the good product. A deep product flow compounds the sifting process, as the lighter siftings will migrate to the top of the flow as it travels down the vibrating deck. To gain capacity and to overcome this piggy-back ride of the siftings, the LMC Advent is much wider than the conventional cleaner. Advents are manufactured in widths of 4, 5, 6 and 7 feet to provide this required spread for the desired capacity. Sizing technology dictates width for capacity and length for precision. That is why each machine is designed with decks up to 7 feet wide and 16 feet long. if extra precision is required for a difficult separation, the decks can be designed with more length to attain the proper separation.